Pompeii was a lively resort flourishing in the shadow of Mount Vesuvius at the height of the Roman Empire. When Vesuvius erupted in an explosion of flame and ash, the entire town would be destroyed. Some of its citizens died in the chaos, some escaped the mountain's wrath . . . and these are their stories: A boy loses his innocence in Pompeii's flourishing streets. An heiress dreads her wedding day, not knowing it will be swallowed by fire. An ex-legionary stakes his entire future on a gladiator bout destined never to be finished. A crippled senator welcomes death, until a tomboy on horseback comes to his rescue. A young mother faces an impossible choice for her unborn child as the ash falls. A priestess and a whore seek redemption and resurrection as the town is buried. 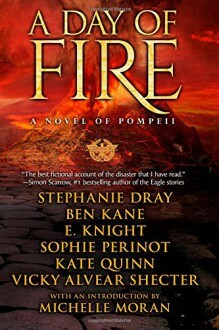 Six authors bring to life overlapping stories of patricians and slaves, warriors and politicians, villains and heroes who cross each others' path during Pompeii's fiery end. But who will escape, and who will be buried for eternity?